(Denver, CO) – Members of the coin collecting community just got another reason to attend the biggest coin show of the year. 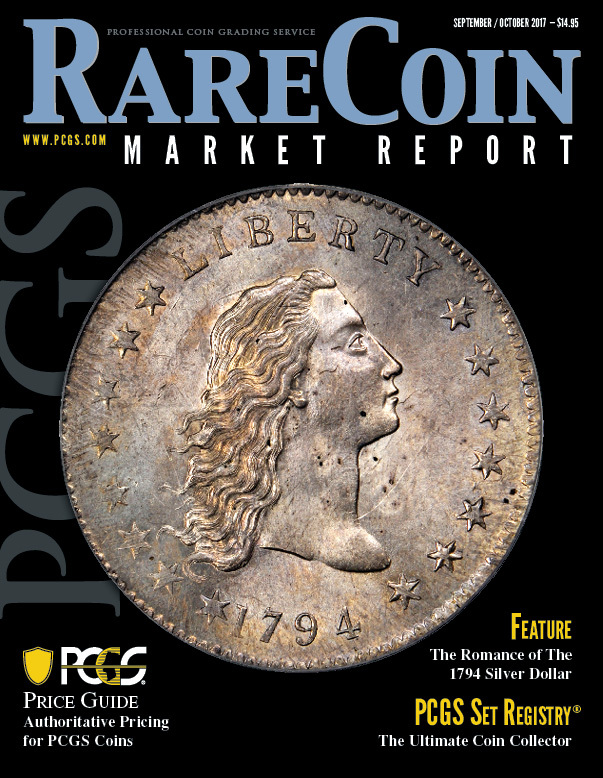 During the World’s Fair of Money, August 1-5, 2017, Professional Coin Grading Service (www.PCGS.com) is bringing back its coin pricing publication, Rare Coin Market Report, and distributing free copies to those who visit the PCGS booth (booth 114). The Rare Coin Market Report returns, and World’s Fair of Money visitors can obtain a free copy of the re-vamped magazine at booth 114. Returning from its original 14-issue run from 2007 to 2008, the bi-monthly magazine will contain a wealth of numismatic material throughout its pages, including pricing info for PCGS graded rare and modern coins, plus articles from leading PCGS experts. “There’s always so much going on in numismatics, each and every day, and we’re very excited to share market news, analysis and expertise with the coin collecting community,” said PCGS President Don Willis. Each issue of the magazine boasts years of renowned numismatic expertise, straight from the minds of prominent figures from throughout the industry. Contributing authors will include Collectors Universe President David Hall, PCGS Co-founder John Dannreuther, numismatic expert Q. David Bowers, PCGS CoinFacts President Ron Guth, and the magazine’s editor-in-chief, PCGS Director of Education Mike Sherman. “We plan on including a wide range of entertaining numismatic articles, spanning from the history of an iconic coin series to spotlights of notable collectors, comparative analysis of coins from past to present, and more,” said Sherman. Visitors of the World’s Fair of Money can obtain free copies of the magazine while at the show. Beginning September 1, 2017, issues will also be distributed on a bi-monthly basis to members of the PCGS Collectors Club, PCGS Set Registry and PCGS Authorized Dealers. Individual copies can be purchased for $14.95 from www.PCGS.com. “As a pricing authority on coins in the digital medium, it makes sense for PCGS to expand into the print realm once more. Now, with the RCMR, collectors can stay informed on the coin market, as well as read great articles from respected numismatists,” said Hall. 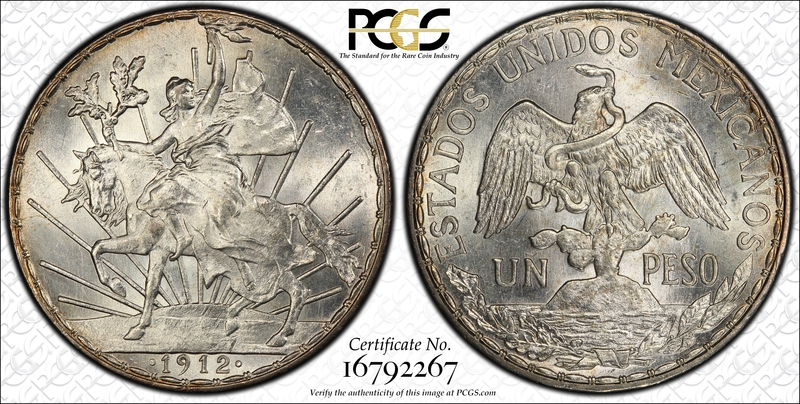 This and other coins of the McVey Mexico Silver Peso date set will be on display at the PCGS Set Registry booth (booth 116). World’s Fair of Money attendees also have the opportunity to view two impressive sets of world coins, both owned by lifelong collector and PCGS Set Registry member Charles McVey. The PCGS Set Registry (booth 116) is displaying the McVey Canadian Dollar Date Set, consisting of 28 silver coins with portraits of three different British monarchs, as well as the number one-ranked McVey Mexico Silver Peso date set — a set that won a gold award in 2016 for Best Mexican Set, and consists of 41 circulation strike silver pesos, dated from 1866 through 1945. “We’re very thankful for Mr. McVey to provide us with the opportunity to display these beautiful coins. Those who visit our booth are in for a treat,” said PCGS Set Registry Director BJ Searls. PCGS Representatives will be available throughout the pre-show (the PNG/ANA Numismatic Trade Show), and the World's Fair of Money to answer questions, accept standard and bulk submissions and provide additional company information. On-site grading will be offered. For more details on PCGS services for the World’s Fair of Money, visit www.PCGS.com/Shows. The World’s Fair of Money takes place August 1-5, 2017, in Denver, Colorado. The show will be held at the Colorado Convention Center, located at 700 14th Street, Denver, CO 80202. The pre-show will also take place at the Colorado Convention Center, July 31, 2017.